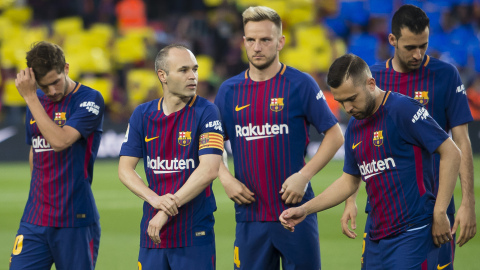 On May 6th, during El Clásico (FC Barcelona vs. Real Madrid)– the most watched domestic club match in the world – FC Barcelona premium partner and leading home appliances brand, Beko, gave up its logo on the players’ shirts, trading it for a very worthwhile and important cause. Instead of the brand logo, the sleeves worn by the likes of Pique, Messi, Suarez, Ter Stegen and Rakitic have been traded in and read #EatLikeAPro, encouraging supporters from around the world to post about their own healthy eating habits which will in turn help Beko raise €1,000,000 for UNICEF. About FC Barcelona: FC Barcelona was founded 118 years ago in 1899, and is unique in many ways. The club is owned by its more than 145,000 members and can boast of being the most successful club in Europe over the last ten years. In that time they have won four of the Club’s five Champions League titles and seven of their 24 domestic league titles. Due to its very special personality, ‘Barça’ is recognized as being ‘more than a club’. The team’s distinctive style of play is projected around the world by the best players and coaches of their time in combination with club’s famous reliance on homegrown talent. About Barça Foundation: The Barça Foundation was launched in 1994 to support the children and youth of the most vulnerable social groups through sport and education in values, with the objective of contributing to a more just and inclusive society. The Barça Foundation frames its activities within the UN programmes Sport for Development and Sustainable Development Goals. The main action lines are educational access and support, violence prevention and conflict resolution in childhood and youth and fight against social exclusion and discrimination. Today, the Foundation reaches to more than 1,000,000 beneficiaries from around the world.